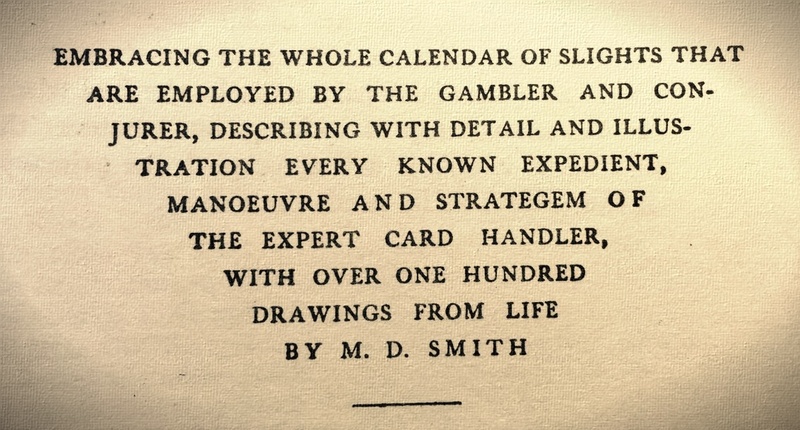 More than 100 years ago, this seminal book on manipulating cards for gamblers and conjurers saw print. It went largely annoticed for several decades. Then the craze about the book, it’s deep insights and revolutionary moves, its writer and his possible background started. But, despite a well-equipped army of dedicated students and researchers, the true identity of S.W. Erdnase, the proclaimed author of “The Expert at the Card Table”, remains one of magic’s best kept secrets. If you are new to the ride, grab a copy of Erdnase (here‘s an electronic version, and it’s free), get Hurt McDermott’s seminal introductory text, Artifice, Ruse and Erdnase, and follow the longest thread in magic history over at the Genii Forum. You are in for an intellectual treat! Facts vs. Factoids: What’s in an Anagram? One of the arguments over Erdnase hovers around the assessment of how convincing or even self-evident hidden meanings in anagrams or text passages actually are. To me, they are factoids, in the sense that they do not really help us identify Erdnase now. They cannot stand their own ground because they only “work” in a given, predetermined context. Only in retrospect, once we have found him for certain, we will thus be able to see to what degree these possible hints were actually deliberately chosen by the author, I’m afraid. Some are fun, some may “draw sense” or even have a ring of truth in them in relation to the real person behind the name; yet I am sure that all of them are purely accidental (unless their parents convince me otherwise). As for the word ERDNASE, its six different letters unfortunately rank among the ten most used ones in the English language (ETAOINSHRD) and even among the top eight in German (ENISRATD), allowing for many variations and speculations. Only the “W” is much less common and may thus be a more relevant clue if there actually is a connection between the pseudonym and the man behind it. a) I consider myself well-read, but in decades of reading thousands of books and magazines I had never ever encountered the word before discovering our S. W. Erdnase (yup, that’s only n=1). b) From the many German compound words beginning with Erd- (like Erdäpfel, Erdatmosphäre, Erdgas, Erdnuss, Erdreich, Erdrutsch, Erdumlaufbahn etc. ), Erdnase seems to be among the rarest ones (together with its topographical opposite, Erdfall). The word is actually so rare it is not even listed in current editions of the German language bible, Der Duden, and also not in the Knaur. c) Having run some search queries myself I think Erdnase is probably the noun or name with the fewest hits I have ever gotten in any online search. Yes, there are a few, but even among those I have found some that refer to the topographical “earth nose,” (see below) and some to a cute nickname for dogs and others for kids sticking their noses into the soil and getting dirty in their faces. d) Much better known German synonyms for a dirt-digging rascal or “mudlark” would be Schmutzfink or Dreckspatz, for example (in literal translation: mud sparrows or dirt finches). They may have been around for hundreds of years; I certainly would have bought these terms as “common”, but not Erdnase. e) In my view, none of these words would actually qualify as nicknames in the sense of labels permanently applied to a person (like Dwayne “The Rock” Johnson – don’t ask me why he just crossed my mind) and used to identify him or her precisely; their use is clearly context-based, not universal. I could probably imagine a mother calling out “Get out of the mud and come into the house now, you little dirty Erdnase!”, but not “Erdnase, come down for dinner, please!” Thus, it also seems rather unlikely to me that someone would remember a descriptive, contextual and non-personal label like Erdnase or Mudlark as their “personal childhood nickname” and put it to good use for hiding their identity decades later. If you think the above is a stronger point for the topographical “earth noses” miners may be dealing with, behold. Again, there are very few hits in an online search. I have also checked with several mining dictionaries online (not from 1900 or older, though), and none of them carried this word nor any other special word with “Erd-“. And even though the word Nase (nose) has several meanings in other contexts, the Duden lexicon does not offer one referring to hills or piles of earth. Besides, wouldn’t miners be more concerned with digging holes (= Erdfall) than with piling up the soil? Speaking of topography, however, it seems possible to me that “S.W. Erdnase” in fact describes a location where the author could have been found at a certain point: somewhere south-western of a prominent “Erdnase” (= hill). Turning toward the famous “Embracing the whole calendar…” triangular section of the title page, any “proof” of authorship taken out of that context becomes even more shaky in my view. The reason: Those nine lines with 41 words and 211 letters include every letter of the alphabet at least once, except for “q” and “z” (so we can at least rule out finding Hofzinser or Tamariz there). Considering this, it is not the least surprising to identify traces of almost any candidate that you’d ever hope (or want) to find there. In best Edgar Allan Poe fashion, one could also argue that the real author of TEATCT is hiding in plain sight on the frontispiece. The only real and meaningful name we find there is the one of M.D. Smith, apparently “only” the book’s illustrator. But has his personal background already been checked thoroughly? Besides undoubtedly being an artist, could he have been the card master himself, the “expert card handler” mentioned a few lines up? Was he definitely too young to qualify? Actually…. There are 3 names down that were engineers to the design, not including the author. And the most incredible thing is that all names down are included to the words that fit there position. You may have only one….. The remaking word when read across will tell you something about the conjuror. And you are absolutely right about the name thing…not an anogram, nor reverse…that was the ruse in design. It is indeed a complex cipher. And here is how you find all answers. Follow the literary trail only! And you no longer need Smith when reaching the first book.